Do you often stay awake at night looking out at the stars and wishing to explore the unknown depths of the universe? You do? So then it’s safe to say that you’re ready to boldly go where no man has gone before, right? Excellent! You’ll be a perfect recruit to join our Starfleet. 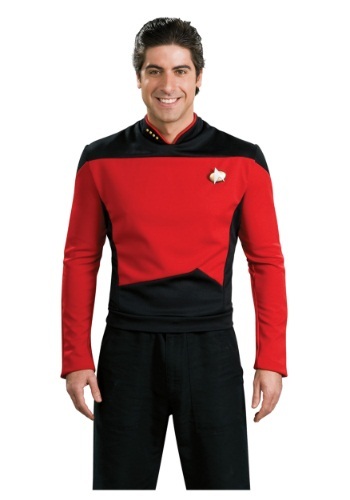 All you need to do is grab this awesome Star Trek: Deluxe Uniform. Now don’t shy away from it due to its color being red. We realize that back in the days when good ole Captain Kirk was in command, a redshirt was the last thing you wanted to be. Not many of them made it back alive from the daring missions they were sent out on. They were seen as expendable under Kirk’s command, but when Picard took over as captain in The Next Generation the red Starfleet uniform took on a new meaning. Picard wore it himself and so it went on to indicate a captains’ position. Now then, since Picard has stepped down as commander of the USS Enterprise, the crew needs somebody new to lead them into the endless frontier of space. If you’re ready to keep the captain’s chair warm and explore the great unknown, then this Star Trek: TNG Adult Deluxe Command Uniform is calling your name! Grab some black pants and this officially licensed Star Trek top, attach the collar pip pins you desire, and be prepared to finally live out your greatest fantasy. With this Red Command Uniform, you’ll be able to make it so, with no problem at all! Set phasers to FUN and enjoy an amazing Halloween.